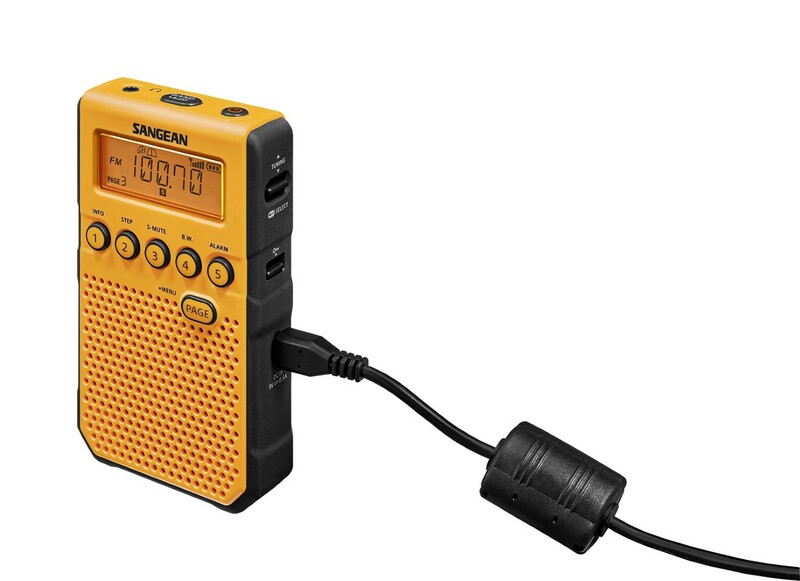 The Sangean DT-800 is Sangean’s new top of the line Walkman-style radio and it is another winner. I’ve owned several Sangean earbud portables from the earlier DT-200 and DT-400W to the newer DT-160 and DT-210 and have found them to be excellent performers, particularly the newer DT 160 and DT-210 models, both of which are excellent, but the DT-800 tops the list with some added features and a better built-in speaker than usual in these Walkman-style radios which are meant primarily for headphone use. Actually, the speaker is more than a convenience…it is necessary for the Weather Alert function to be usable. 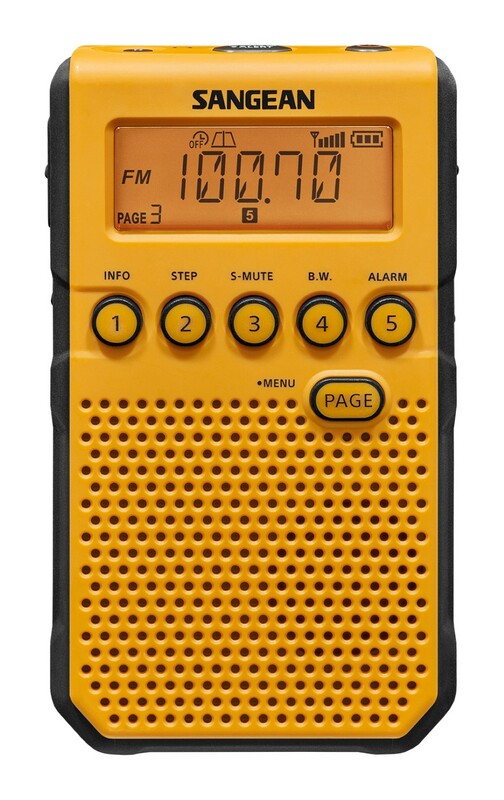 The DT-800 is available in Yellow or Black with YL and BK extensions to their model names (see the links for each at the end of this review). The list price is $99.99 but I found them at Amazon for about $62. 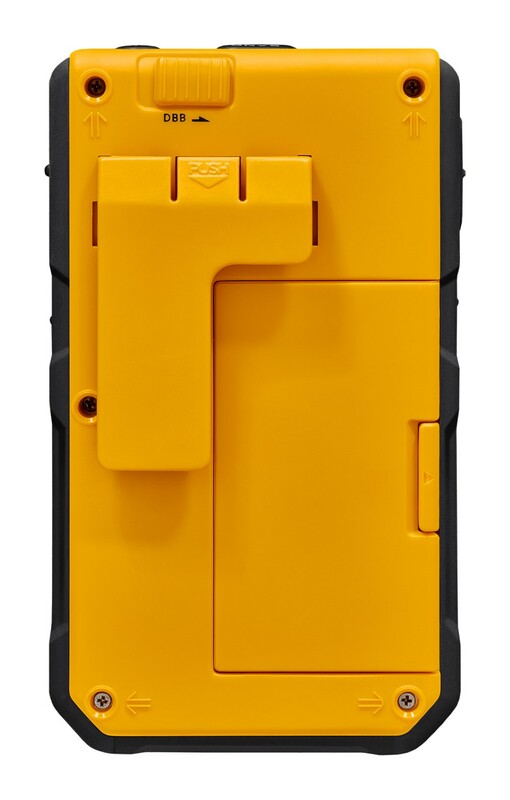 I selected the Yellow version because, like the older DT-400 it reminds me of the old Sony Sports Walkmen which were so iconic in their day. But the DT-800 leaves the old Walkmen in the dust when it comes to performance and the list of features is formidable for such a compact package. 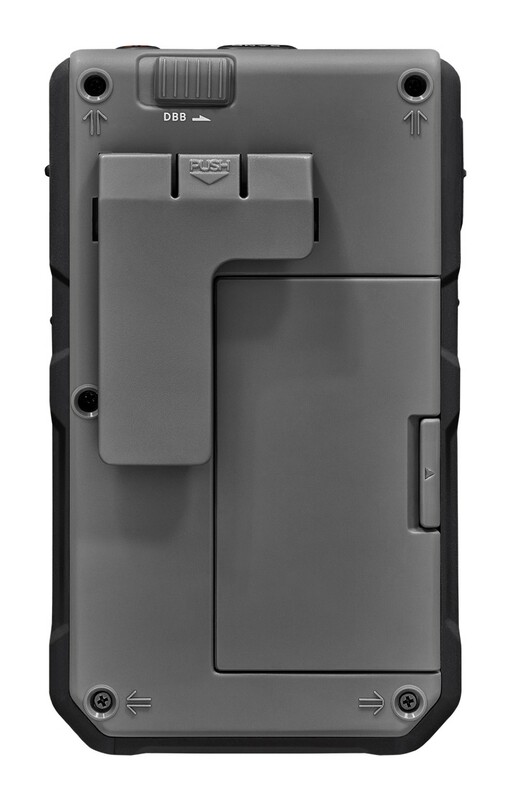 Checking It Out: I was immediately impressed by the quality of the DT-800 and its included accessories. Sangean has set a high bar for overall build quality with their products. The packaging is deluxe for a hand-held radio, the supplied AC power supply and the sound-isolating earbuds are all better than usual. I expect the DT-800 will perform flawlessly for many years. Sangean does not state if this is a PLL or DSP unit but the facts that it has soft muting and dual bandwidths on AM and FM tell us it is a DSP design. I am happy that Soft Mute can be disabled because I don’t like soft muting which works against AGC (Automatic Gain Control) which all modern radios have. Briefly, AGC attempts to keep all stations at the same volume regardless of their strength. This makes tuning across the dial and listening to weaker signals much more pleasant because it helps to minimize volume changes. On the other hand, Soft Mute works against AGC. It is supposed to silence inter-station noise but the reality is that is also pushes weaker signals down in volume, sometimes unpredictably. It is something an engineer in a laboratory thought up as the latest great idea and it seems to be part of all DSP chips, but the radio manufacturer can choose to adjust or disable it if they want to. But for anyone who LISTENS to the radio and to less than perfect AM reception can tell you, soft mute does more than reduce noise between stations…it can make the volume of weaker and varying signals variable with weaker stations unnecessarily quiet. In other words, the cure is worse than the disease. I think soft mute should be eliminated. Period. There are some very nice radios which are unnecessarily hobbled by it. So, it is great that soft mute can be turned off here…I would turn it off right away. Another unusual feature of the DT-800 is dual bandwidths on both AM and FM. Many radios have bandwidth adjustments for AM where narrower bandwidths increase selectivity to help separate closely-spaced stations on a crowded dial, while wider bandwidths give more treble response for better signals. On FM, selecting a narrower bandwidth increases selectivity just as it does on AM but instead of a big reduction in high frequency response, you get slightly increased distortion. 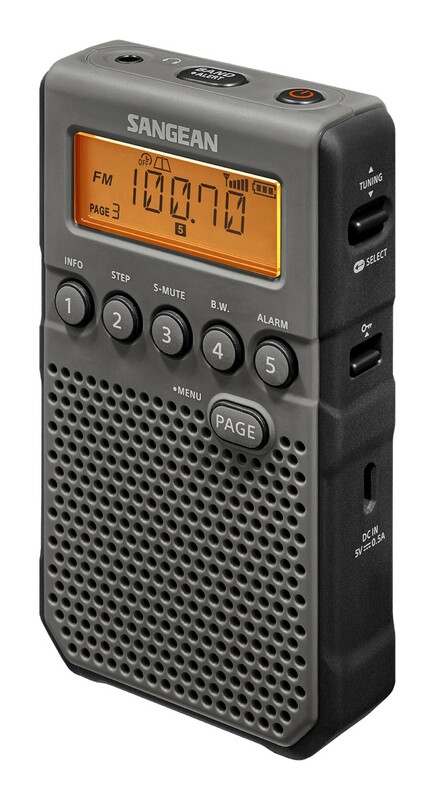 By portable radio standards the change in sound is more subtle but the sound is clearer and more open in the Wide Bandwidth FM setting so I would use that unless you need maximum selectivity for crowded signals…it’s great to have the option. Reception: I compared the DT-800 with several other earbud portables and found both AM and FM reception to be as good as it gets in this kind of radio. 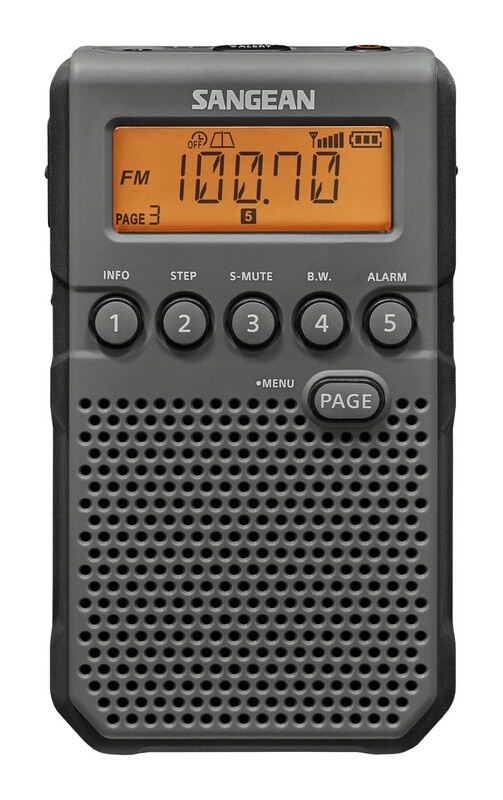 AM is never top shelf in very small radios because of their necessarily small built-in AM ferrite rod antennas, but no other Walkman-style radio will outperform the DT-800 on AM. FM was also exemplary as in many modern radios with excellent sensitivity and selectivity. Even in Wide FM mode it was very selective and good enough for most of my listening – it’s FM is far more selective than older designs such as the DT-400W which is a nice radio but not super selective on FM. I did find a few neighboring, interfering signals which were helped by switching to Narrow mode so again, although you may not need it, it’s a great option to have available. Sangean really did their homework on this one. FM RDS functioned as you would expect and the Auto Clock set via FM RDS worked as it should. NOAA Weather Band was also very sensitive and pulled in weaker signals as well as any other Weather Radio I have tested, and far better than most vintage radios with Weather Band. I could not test the Emergency Alert feature but expect it will work as described. Be sure to keep the unit plugged into AC power whenever possible while in Alert Mode as this uses power full-time, requiring the radio to monitor for alert information even though it is silent until an alert is sent. This is true for any battery-operated radio with Weather Alert. Use AC power when you can and keep the batteries for backup if power goes out. The DBB (Dynamic Bass Boost) function worked similarly to other Sangeans. Some earbuds may sound too bassy with it but with leaner sounding earbuds it adds a nice warmth and fullness to the sound. Menus: There are many settings found in the Menu so it is worthwhile to sit down with the radio and the Owner’s Manual which is very clear and well-written in contrast to many off-shore manuals these days. I find this is necessary to become aware of all the features and settings. After you do the initial setup and play with some of the settings you should find you can get along without the manual because the design is fairly intuitive, but I always read the manual initially, then keep it handy for future reference. I regularly receive emails with questions which are answered in the manual so my advice is to always READ THE MANUAL! (You can download Sangean’s manuals from their website). Speaker: Walkman or earbud type radios may or may not have built-in speakers. While these radios are designed primarily for earbud use, the addition of a speaker can be of great utility, and as I mentioned above, is a necessity if you are using the Alert feature to monitor NOAA Weather for Alerts. The speaker in the DT-800, although not as full and rich sounding as in some traditional hand-held radios (such as Sangean-s own SR-35), is nevertheless as good as the speaker in any earbud style radio I have tested. Conclusion: I am lucky enough to own quite a few earbud-style radios from several manufacturers and while a few match the DT-800 in one area or another none outperform it overall…they just don’t get any better than the DT-800. 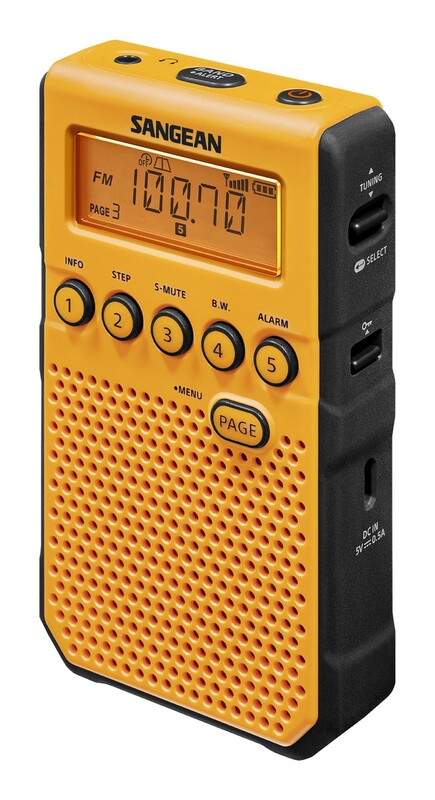 It will deliver the best AM/FM/WX reception possible in this kind of radio with a long list of features and excellent build quality at a reasonable price. It is my new reference in this category.